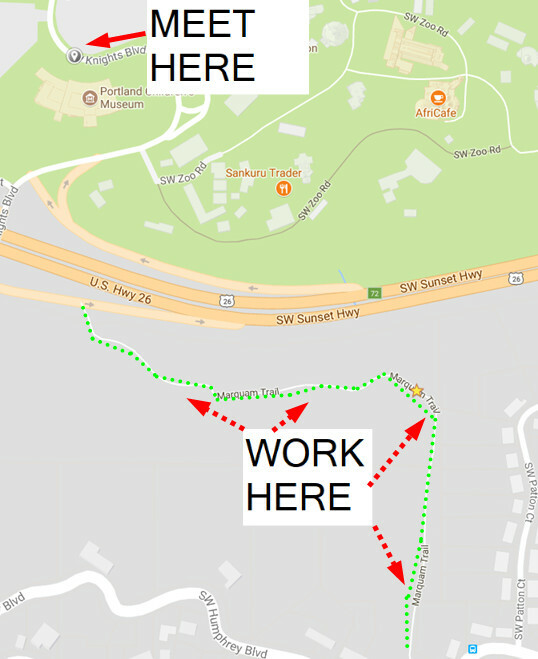 SW Trails monthly first Thursday Work Party on August 3rd will be on the 4T Trail or Markham trail as it heads up toward Patton Rd from the highway 26 on ramp. We will be doing tread work, trail grading, brushing, possibly work on some steps as the trail heads up the hill. Our work area is shaded for the most part and the work party has been reduced to 2 hours because of the expected heat that day. Be a bit early and we can get going at 9 AM and work util 11AM. Our meeting point will be the parking lot across from the children’s museum. Parks will provide a parking pass for the day and we will gather by the parks pickup and all walk to the trail head as a group. Parks will bring coffee, snacks, water, usually some fruit. On these work parties it is not necessary to stay for the whole event and you can work at whatever level your skill and energy allows. It is just great to meet and get a little trail work in, and on this trail signature trail meeting out of town visitors is also fun. So come on out and join us. Below is a map link to the site. Attire should be sturdy shoes and work cloths. PPR-LS will provide all the tools and gloves.